Released on 30th Oct 1983, "Uptown Girl" became the first and only No.1 hit for Billy Joel in the UK, selling around 975,000 copies and becoming the second best-selling single of 1983 - "Karma Chameleon" by Culture Club was the top-selling single. 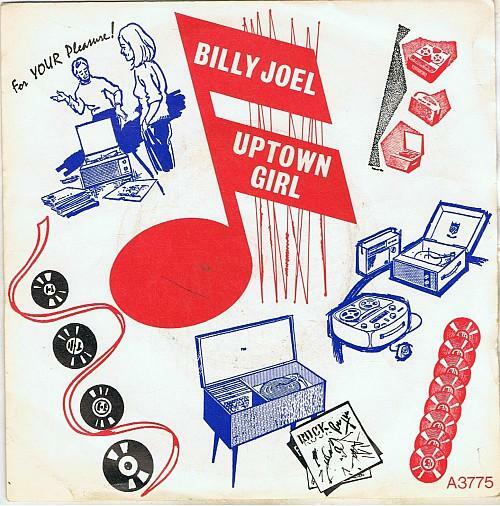 With its retro 60s vibe, you may be forgiven for thinking that "Uptown Girl" was a cover, but it was an original song penned by Joel himself and produced by Phil Ramone. It was released as the second single from Joel's ninth studio album An Innocent Man, and was the follow-up to "Tell Her About It" which had reached #1 in the U.S. and #4 in the UK. The single entered the UK singles chart at #94 on 2nd Oct 1983, reaching #1 on 30th Oct, where it remained for five weeks. The song also topped the charts in Australia, Ireland and New Zealand and reached #3 on the Billboard Hot 100 in the U.S. and also reached the top ten in numerous other countries. 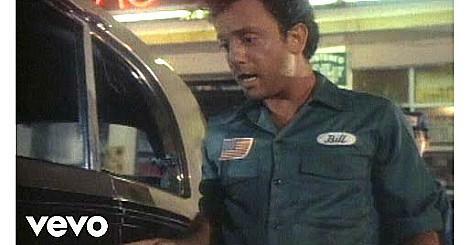 Joel has stated that song's doo-wap style was influenced by Frankie Valli and The Four Seasons, and the lyrics were partly inspired by their song "Rag Doll". Joel's lyrics are about a working class mechanic trying to gain the attention of an upper-class uptown girl, who was played by the model Christie Brinkley in the video - Joel actually went on to marry her in 1985. The video is very literal and is dominated by dance routines, and starts with Billy Joel and three mechanics drooling over the high class girl in a magazine. There is also a poster of her on the wall. The girl turns up at the garage in a chauffeur-driven Rolls Royce, where Joel and his fellow mechanics are working. They dance around the car while cleaning the windscreen and lights and generally admiring it. She eventually steps out of the car and becomes part of the dance routine with Joel and the boys following her around while her chauffeur looks on. The video ends with Joel and the girl dancing together before he rides off with her on the back of a motorcycle. The 12 inch EP has the same sleeve and includes the tracks "My Life" as track 2 on side A, with "Just The Way You Are" and "It's Still Rock and Roll To Me" on the B-side. These were actually penned while Joel was dating the supermodel Elle Macpherson in an on/off relationship. When she went away to work in Europe, the relationship was very much off and Joel started dating Christie Brinckley. He adjusted the lyrics to reflect this new relationship. Apparently, whilst in the Caribbean on holiday, Billy was playing the piano when he looked up to notice Macpherson, Brinckley and Whitney Houston (who was a model at the time) stood listening to him play. The working title of the song "Uptown Girls" reflected his experience of being surrounded by models who were attracted to him, despite being from a working class background.